The best speakers? Your speakers! It's hard to imagine a graphic designer working with a small, black and white TV set, or a painter doing his thing in a badly lit room. Well the same goes for a musician: his/her monitoring system ought to be as faithful and detailed as possible so that nothing escapes his/her attention while mixing, resulting in perfectly balanced songs, both in terms of frequency and localization of sounds across the sound field. Together with the acoustics of your studio, your monitor speakers are probably the single most important element in your audio chain. In the end, the fact that you can take good or bad decisions when making or mixing music depends largely on them. Hence, if your speakers tend to boost or attenuate the lows or the highs, when something sounds balanced through your speakers, it will most probably sound completely off-balance on other systems, like your car stereo, personal music player or a friend's hi-fi system. And since one of the main goals of music is to be shared, it would be wise of you to make sure that your mixes sound right almost anywhere. So, if there is something you should give priority to when buying gear that's your speakers. They will have a much bigger impact on the quality of your productions than the converters on your audio interface, the processing power of your computer, the features of your software, and the frequency response curve of your mics. And the investment is even more worth considering the long life speakers usually have. Unless there's a technical revolution that turns the world upside down (which hasn't happened in decades), there's no reason not to keep your speakers 10, 20 or even more years. I know I risk sounding like a broken record, but I would like to stress one thing again: do not cut your budget on room acoustics to invest in speakers. 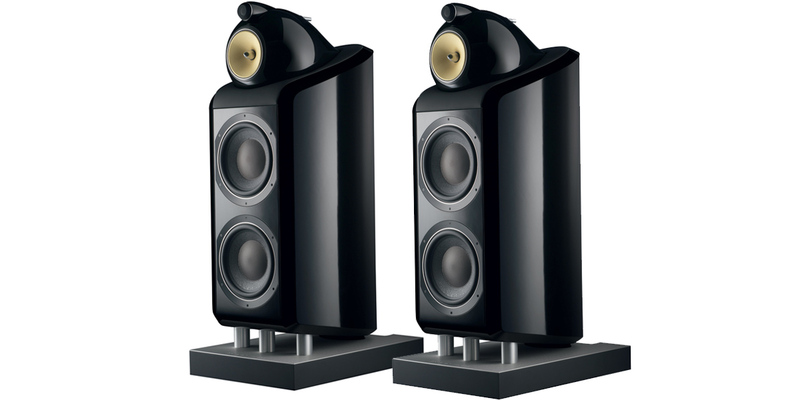 A pair of high-end speakers in a room with poor acoustics is worse than a set of entry-level speakers in a room with good acoustic treatment. 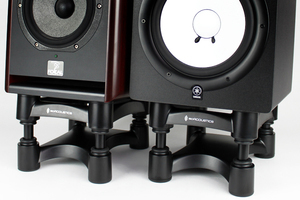 Okay, now we can dive into today's topic and start discussing several buying tips for monitor speakers. And what better way to begin than recalling what a speaker is. The similarities between speakers and microphones is such that you can actually use a speaker as a mic, like Ken Towsend did to record Paul Mc Cartney's bass during the Paperback Writer sessions. In fact, there are mics based precisely on this idea, like the Yamaha Subkick. From a functional point of view, a speaker does exactly the opposite of a microphone: while the latter transforms the movement of acoustic waves into electric current, a speaker translates electric current into acoustic waves. A connector to link it to the audio chain so that it can receive the signal to reproduce. A driver that plays the role of a transducer, transforming the electric signal into sound. A cabinet, usually made of wood or plastic, where the rest of the elements are placed. Do note however that most speakers are less rudimentary than that. They usually include several drivers, which implies the use of filters to split the signal between them, sometimes an amp and other types of connections, settings, switches, etc. Why use several drivers you ask? That's a very good question, especially if you consider that the more drivers there are within a speaker, the harder it is to balance its sound. The problems arise with the filters and the fact that the frequency bands inevitably overlap, which results in lots of problems in terms of the waveforms created, not to mention the ensuing resonance of the cabinet. But then why do it? Well, simply because we still haven't found any material or technology that allows you to build a speaker that can reproduce perfectly both low and high frequencies. To reproduce the highs you need a diaphragm capable of moving very fast (remember: 15,000 Hz means 15,000 movements per second), whereas to reproduce the lows you need a diaphragm that can make very large movements. So the tech specs aren't the same at all from a mechanical point of view and to be able to satisfy these completely opposite requirements, you need very different designs, calling for very different materials and technologies. That's why we distinguish two big families of drivers: tweeters, in charge of reproducing the high end of the spectrum (high-mids and highs) and woofers, which are bigger and responsible for the low-mids and lows. The logic is pretty straightforward: the deeper you want to go, the bigger the driver has to be. While the size of the tweeter isn't too important for its performance, the size of the woofers does provide valuable information about the frequencies it can reproduce. In fact, it's a common practice to distinguish two-way speakers by the size of their woofers, expressed in inches. Hence, you have 5-inch, 8-inch, 10-inch speakers and so on, where an inch corresponds to 2.54 cm. (an 8-inch woofer measures 20.32 cm). Do note that you can find lots of speakers with more than two drivers (three, four, five, six, etc.) and the corresponding implications this has on the filters used, as you will see. The more drivers a loudspeaker has, the more specialized they will be on a given frequency band. Thus you can find a speaker with a tweeter for the highs, a mid-sized woofer for the mids and a big woofer for the lows. But be careful, the number of drivers doesn't necessarily relate to do the number of frequency ranges the signal is split into. If a speaker is two-way, it will have at least two drivers, but the fact that a speaker features eight drivers doesn't mean that the signal is split eight ways, because a single frequency band can feed different drivers. It has four drivers, but it's a three-way speaker. It's a two-way speaker with three drivers. We will come back to this when we get to the buying tips, because we still have one element left to see before we are done with the technical overview of a speaker. We've talked about drivers, filters and "ways," but don't forget that in order for the electric signal to be reproduced, it first has to be amplified. And you must distinguish between the so-called active and passive speakers. The signal must be first amplified before it reaches the driver and there are two solutions to do that: you can amplify the signal with a single amp before the filter or you can amplify it after the filter, which means you need as many amps as the speaker has "ways." In the first case, the speaker is called passive and in the second active. 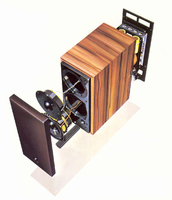 Do note that most active loudspeakers feature a built-in amp within the speaker cabinet itself, which makes most people believe that this is what makes a speaker an active one. But that's not the case. There are some active speakers, like sE Electronic's Eggs, whose amp comes in a separate housing. Active? Passive? Two-.way? Three-way? These questions are probably lingering in your head by now, but before you make any decision let's first see other factors you should consider. A neutral and well-balanced reproduction across the entire frequency spectrum, which translates into a flat response curve or where no frequency range (lows, mids, highs) is above the rest. A perfect stereo image that allows you to pinpoint exactly where every instrument is in a mix. The widest sweet spot possible (the sweet spot is the ideal listening position for a listener to enjoy a well-balanced listening). An excellent dynamic response so you can hear the attack of the sounds (the transients), regardless of everything else that's going on in the mix, while at the same time respecting all nuances (from the faintest pianissimo to the loudest fortissimo). Obviously, every single manufacturer out there strives to achieve this, and every single marketing/communications department tries to convince you that they've actually achieved it. Yet, while all brands use more or lees the exact same arguments and vocabulary, the word "speaker" can take you into so many different realities that it's easy for any beginner to get overwhelmed. After all, both Bose and PMC, as well as Logitech, Funktion One, Roland, and Cabasse, all promise great detail, precision and unmatched fidelity. But what's all this BS? 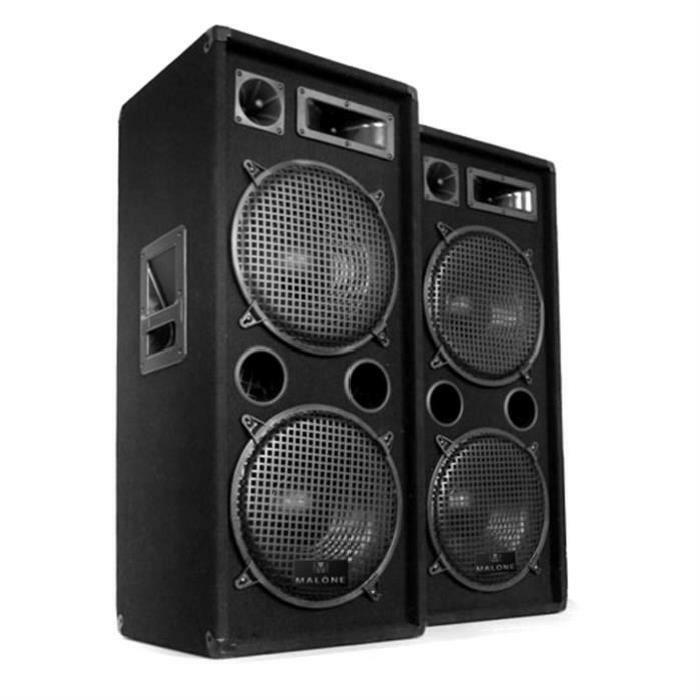 The goal of sound reinforcement speakers is to reproduce sound in big venues (from nightclubs to stadiums, including all sorts of live music events in the middle). 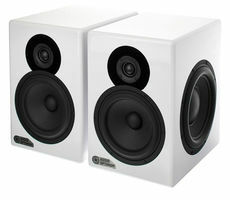 Their main priority is efficiency and they aren't the best suited for use in a home studio (don't laugh, I've seen it...), besides being huge. Next up are hi-fi speakers, with a very complicated market. In their beginnings, back in the '50s and '60s, these speakers sought to provide the highest fidelity possible (after all, hi-fi stands for high-fidelity), which in principle seems quite appropriate for studio use. However, the marketing geniuses working at big electronics manufacturers (Philips, Sony, Denon, Kenwood, etc.) appropriated the term as a pseudo-label in the '80s to open up the elitist market to a bigger public. Thus, hi-fi became an argument to sell anything, from micro-systems with 16-band graphic EQs to radio-cassette players with Loudness and Bass Booster features. And so the original idea of high-fidelity, which never responded to an industrial norm, was completely debased and nowadays is used for anything you can imagine, giving it an air of "certification." Rather than providing a faithful reproduction, the goal is for sound to be nice, pleasing to the listener's ear, sometimes adopting the worse of forms (overblown lows, usually sold as "deep lows," as opposed to the "crystalline highs" they arguably provide), but always with a special attention paid to the speaker's design. All this subjectivity doesn't necessarily correspond to your needs and you'd do well staying away from anything "hi-fi" or associated to it. And you should also be wary of the so-called "audiophile" label, which is used to describe high-end hi-fi products, trying to keep faithful to the original idea behind high-fidelity. 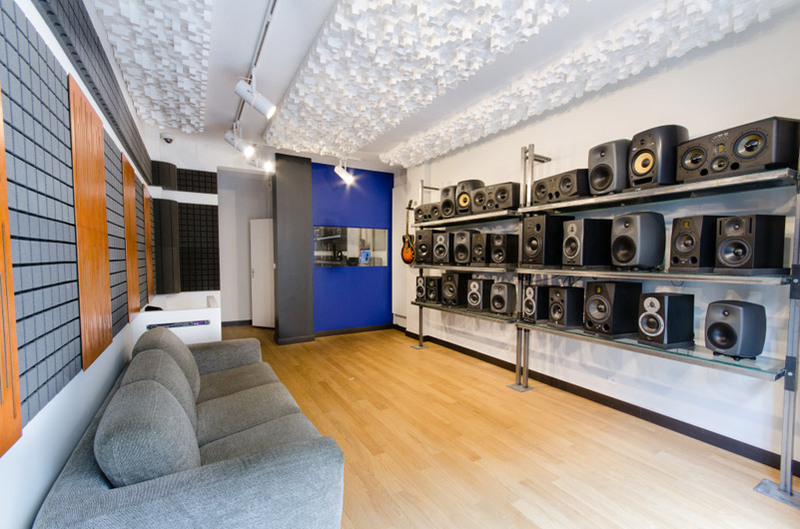 While you can indeed find some audiophile speakers that could be considered for studio use, the investment is ridiculously high and not really justified. Because, unfortunately, the audiophile market has a big tendency to mingle with the luxury one (luxury referring in this case to an indulgence rather than a necessity). This has the awful result of making the looks and design more important than the performance of the speaker itself, and resorting to pseudo-scientific arguments to try to win over a technologically illiterate public. In short, go careful with the audiophile world because even though it can offer some great products, it is generally speaking not the best place to find a good deal. Apart from the marketing mumbo jumbo, you must also consider that there is a big difference between what's expected from a speaker to listen to music and a speaker to make music; in the first case the leisure point of view should prevail, while in the second one a professional perspective is required. 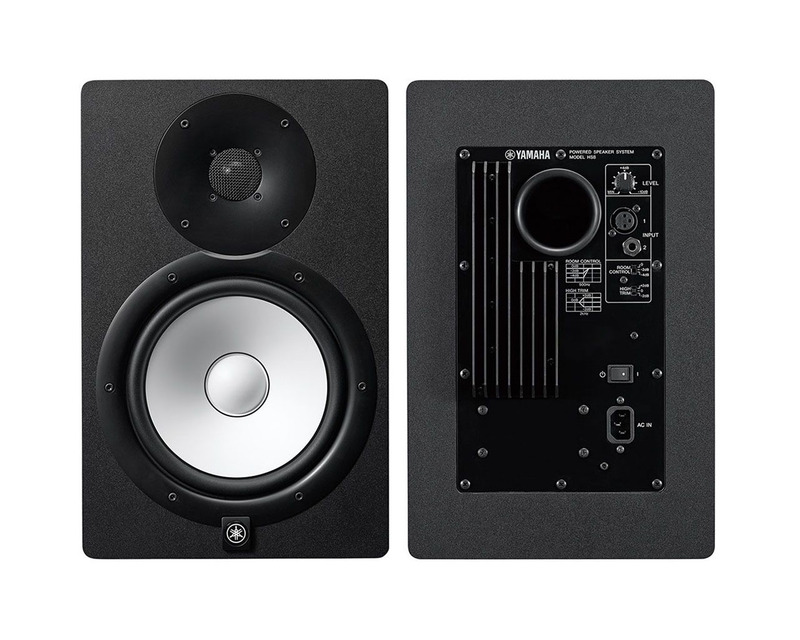 Originally introduced as a hi-fi speaker, the famous Yamaha NS10s featured very aggressive high-mids and were a flop when they came out, before they became best-sellers among studios due to their particular frequency response curve, which was extremely interesting for mixdown. But trust me, no audiophile would like to have a pair of NS10s in his/her home! Multimedia speakers are the poor relatives of entry-level hi-fi speakers you use to hear music on your computer, an MP3 player or a smartphone. 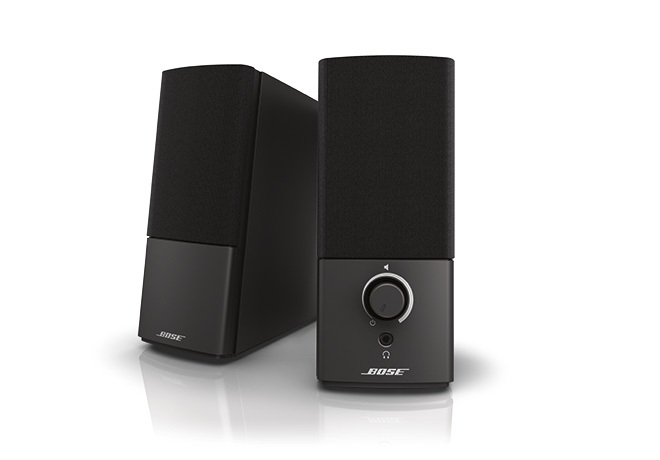 Small in size, they are supposed to provide a pleasant sound, be it to listen to an MP3, play video games or watch a film. 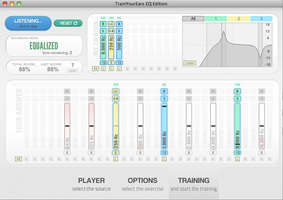 They feature many controls and connections (headphones, volume, bass and treble controls, aux input, etc. ), and have a built-in amp. You could place mobile speakers in this same speaker family, like the bluetooth BoomBoxes which – as far as they might seem from the technical requirements you should expect – can prove very useful. 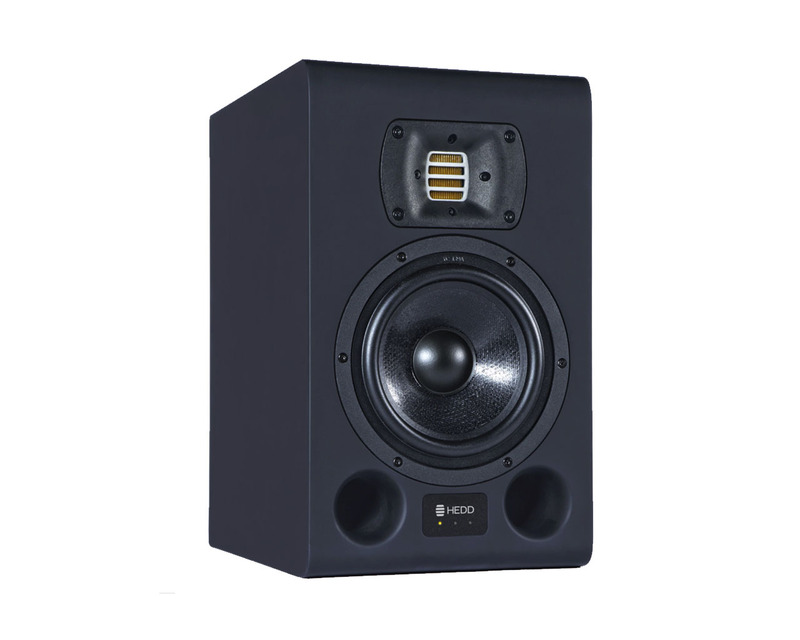 Studio loudspeakers, aka studio monitors, aim to comply with all the technical requirements stated above, namely the most faithful, neutral and detailed reproduction possible. This means they are not the nicest for recreational purposes, just like an SUV is not necessarily the most comfortable car for your everyday life. They are working tools and that's precisely what you should be looking for, even though most other speaker types might prove interesting in some situations, as you'll see later on. 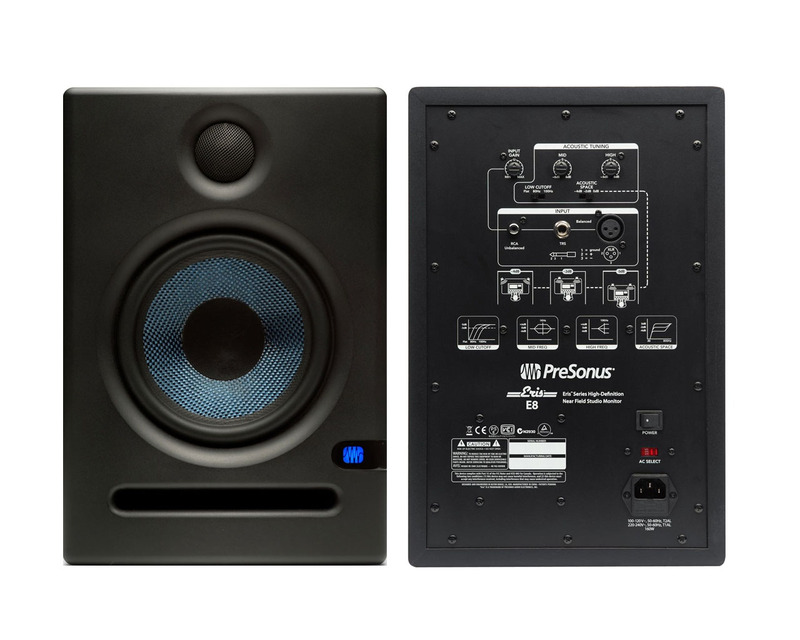 Okay, now that that's clear, let's look into the details of the studio monitors family so we can dive into the heart of the matter: how to choose and buy the right speakers for your studio. 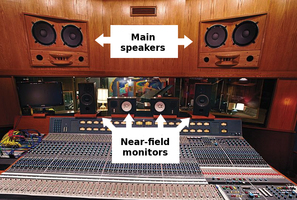 Active or passive, two-way or three-way, studio monitors are usually classified into three big categories, depending on the distance that separates them from the listener's sweet spot, which is in turn linked to the power of the speakers. Thus you have near-, mid- and far-field monitors. For their part, near-field monitors are perfect for our purpose because you can place them 3 ft away from you and, depending on the model, their power can be adapted to small rooms. Besides, most active. two-way speakers are, generally speaking, pretty affordable. 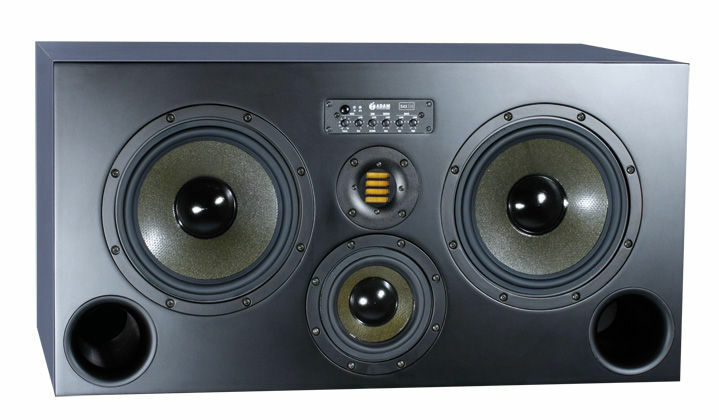 Regardless of whether you are just starting out or not, they are a good option – and the only option if you are penniless.Far-field are the huge speakers commonly found in professional studios, also called main monitors (see image). They are usually imposing and powerful three- or four-way passive systems flush-mounted into the walls by an acoustician who makes sure that they can be nicely driven without generating any undesired vibrations. Do note that they are placed at least 10 ft away from the listener. This means you need a big room and deep pockets, which isn't necessarily the case for the regular home studio owner. So, unless you are planning to open a professional studio, in which case you most probably don't need to read this article, you can forget about them. 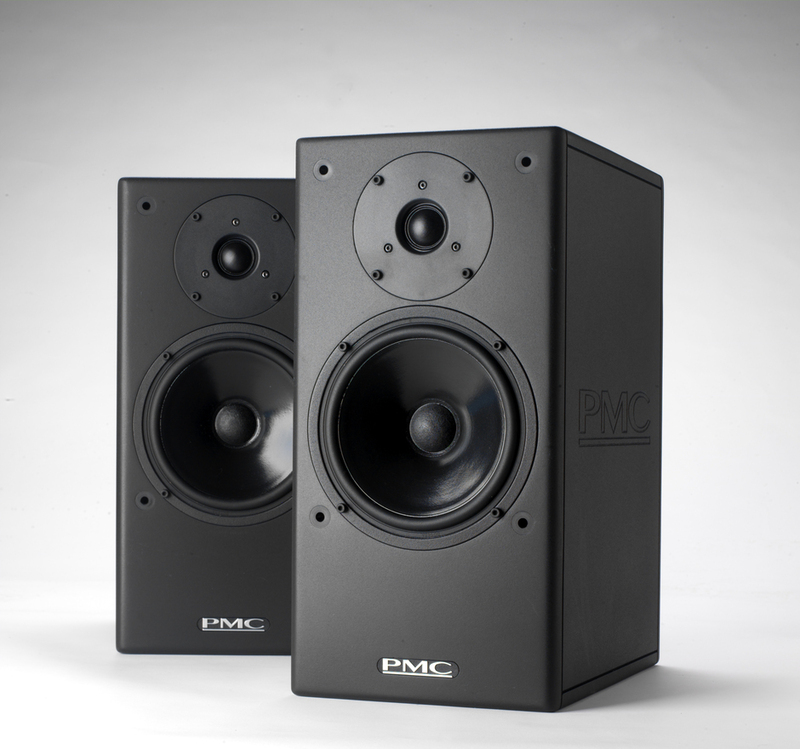 Now, mid-field monitors, as their name implies, are a compromise between far- and near-field speakers. Usually three-way, they ought to be placed at least 6 ft away from the listener, which makes them worth considering for large home studios, if you can afford them. 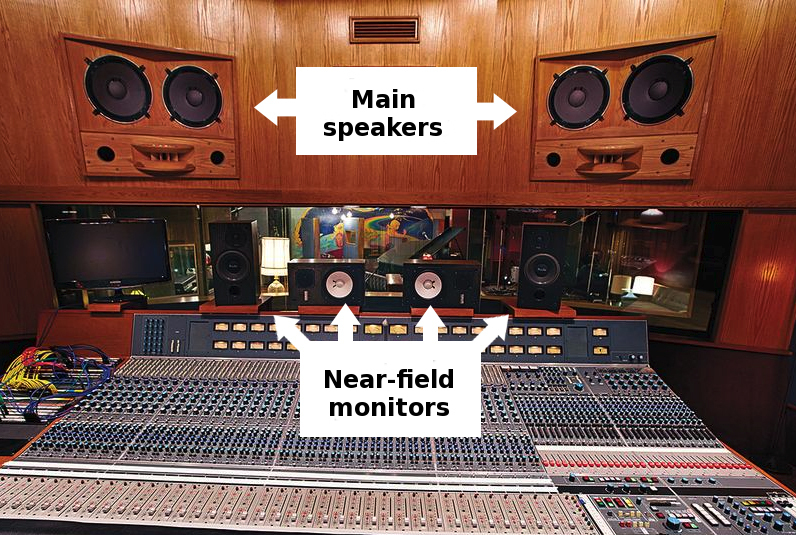 Even if they have main monitors at their disposal, many audio engineers work most of the time with near- or mid-field monitors, because they are more than enough for their needs. The main system will only serve the purpose of checking the mix at the end and getting the okay from the client. That's why they are sometimes called the "impress the client" set. So, to sum it up, as a home studio owner you should settle for near- or mid-field monitors, although the latter only if you have enough room and a couple thousand bucks to spare. The main advantage of near-field monitors is that, since they are meant to be close to you, the influence of the room on the sound is less, which is very good when the acoustics aren't the best. Whatever you do, please use your ears and not your eyes to make you choice! Fitting in a couple of mid-field monitors in a 55 sqft room is ridiculous in more than one count. First of all because you will only be able to use them at very low levels, unless you want to shatter your ears that is, which means your speakers won't work at their optimum volume and, hence, won't perform their best. Second, because you risk having heaps of acoustic problems. Not to mention your neighbors, banker and the people you share your life with. In short, if you buy such speakers do it for a good reason. And the same applies to subwoofers, sometimes used to complement traditional monitors and compensate the lack of low frequencies most of them exhibit. While they certainly do a fine job, they shouldn't be used unless your room is acoustically treated and soundproofed. Getting a subwoofer when you live in an apartment is completely absurd. There is no big difference as long as the sound is good, but it's not for nothing that almost all near-fields are active speakers with a built-in amp. The first advantage has obviously to do with space: there is no need to have an external amp and all that it implies, like a good tangle of cables (don't forget Murphy's law of cables. a cable can only be either too short or too long). If you add the price of the amp to the passive speakers, the amount of money you'll need is much more than for an active set. Finally and most importantly, buying a set of active speakers guarantees that the amps have been conceived and adjusted to match the speakers perfectly. Trying to find the right amp for a pair of passive speakers is no easy task. So, unless you fall head over heels for a passive set of speakers, make your life easier and your wallet happier getting yourself some active monitors. Let me state this as clear as possible: the only thing that counts is the quality of the reproduction. Because even if, in theory, a three-way system ought to be better than a two-way one (since it processes each frequency range more accurately), that's not necessarily the case in practice. Why? Simply because it is much more difficult to configure a three-way speaker when it comes to the overlapping of frequencies between drivers. Add to that the price difference (three-ways are usually more expensive than two-ways) and the dimensions (they tend to be much bigger), and it shouldn't take you long to realize that it's better to invest on a two-way system. But I'll repeat it once again: this is not a rule set in stone and your ears should be the only judge. My point is that you shouldn't fall for the trap of thinking that the more drivers a speaker has, the better it is, especially when it comes to entry level speakers. 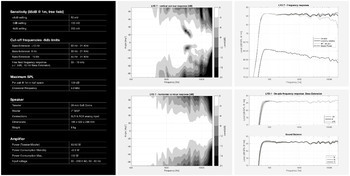 The frequency range allows you to tell which are the lowest and highest frequencies a speaker can reproduce at a given volume, expressed in dBs. The wider, the better. The frequency response curve allows you to see how the speaker responds across the entire frequency range. The flatter, the better. 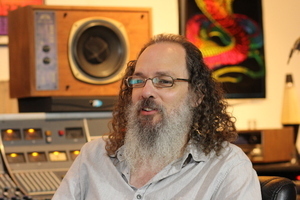 The SPL level, usually measured at 1 meter, determines the power of the speaker (which ideally ought to be 83 dB if you plan to work with audio, according to Bob Katz). 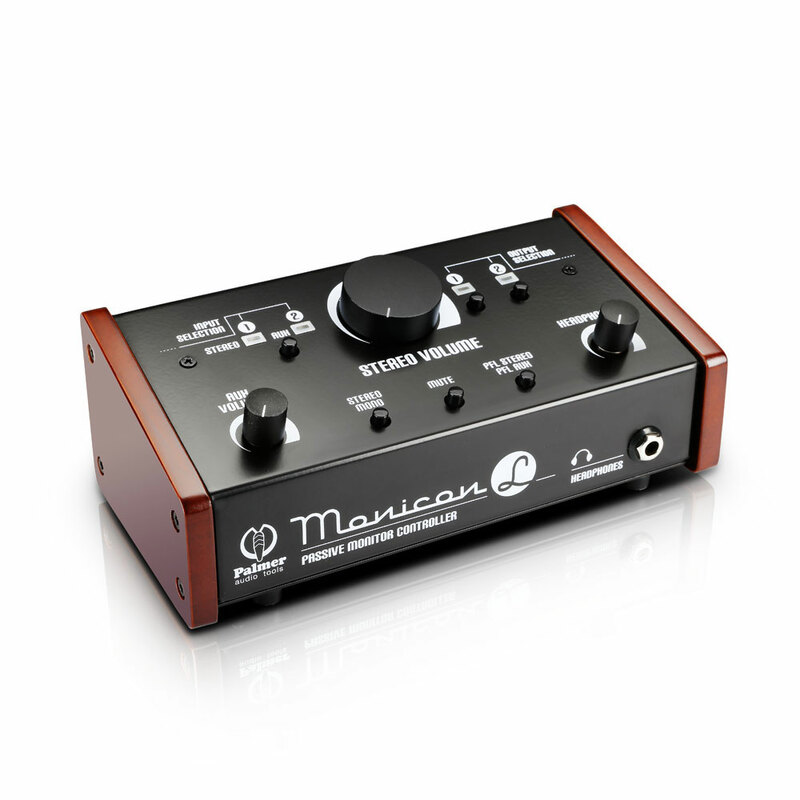 Plus, you can also find the harmonic distortion rate, the signal-to-noise ratio, and many other specs. Apart from that, they also disclose the details of the eventually built-in amps (their amplification class, power), the settings of the crossover filters that split the signal frequencies, as well as the description of the different controls available on the speaker. Plenty of information to help you make up your mind about the speakers you plan to buy... or not. 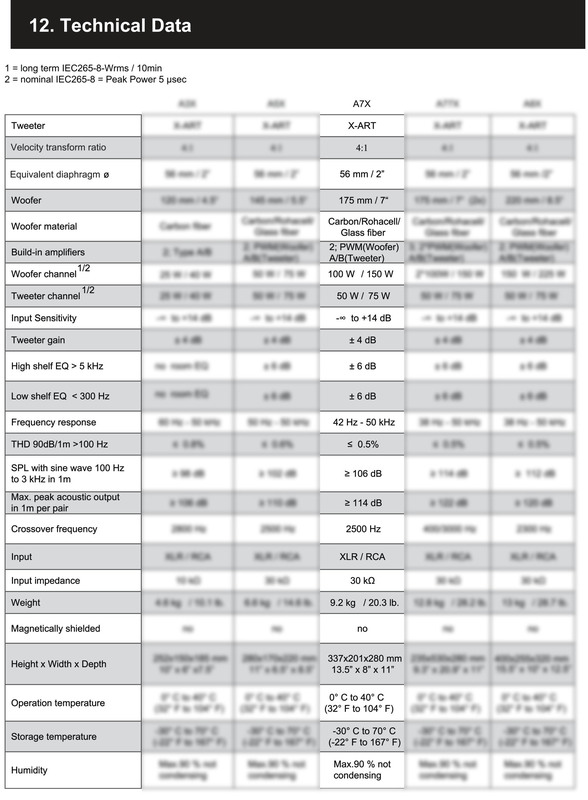 In fact, much of this data is completely useless: a speaker rated at 116 dB SPL isn't necessarily better than one rated at 114 dB, for instance. In principle, frequency response curves are very interesting, but in the end they don't really matter. Why? Because even if they are included (which isn't always the case) and created earnestly (which isn't always the case) and the manufacturer took the time to accurately document how they were measured, this figures aren't really that interesting when choosing a speaker because the protocols, materials and measurement contexts vary from manufacturer to manufacturer. What sense does it make to compare two frequency response curves if they were not measured in the same anechoic chamber, with the same mic and the same measurement rack, or even the same protocol? Not much, unless of course you want to pass as someone in the know when looking at them with your partner. Otherwise, they don't provide too much useful information about how the speakers will perform in situ, since manufacturers always try to sweep the defects under the rug. I recently had the chance to test a pair of speakers whose frequency response curve, provided by the manufacturer, was relatively flat. So it was a big surprise to learn that they produced an awful noise, resembling distortion, at 55 Hz and that the manufacturer – after we contacted him – attributed it to the air coming out of the bass reflex port. Oh, and then there's that former speaker manufacturer employee who told us that curves were drawn by hand... with a ruler! But that applies only to cheap manufacturers, right? Are you sure? Let's take a look at the tech specs of two, in theory, serious manufacturers: Adam and Dynaudio. At first sight, you would think that Dynaudio put more work into it than Adam, including some nice curves together with the specs, whereas the A7X only mention a frequency range spanning from 42 Hz to... 50 kHz! Wow! Measured at what level? At what distance? A mystery! Adam makes up for it by publishing a THD of less than 100 Hz measured at 1m with a 90 dB signal. 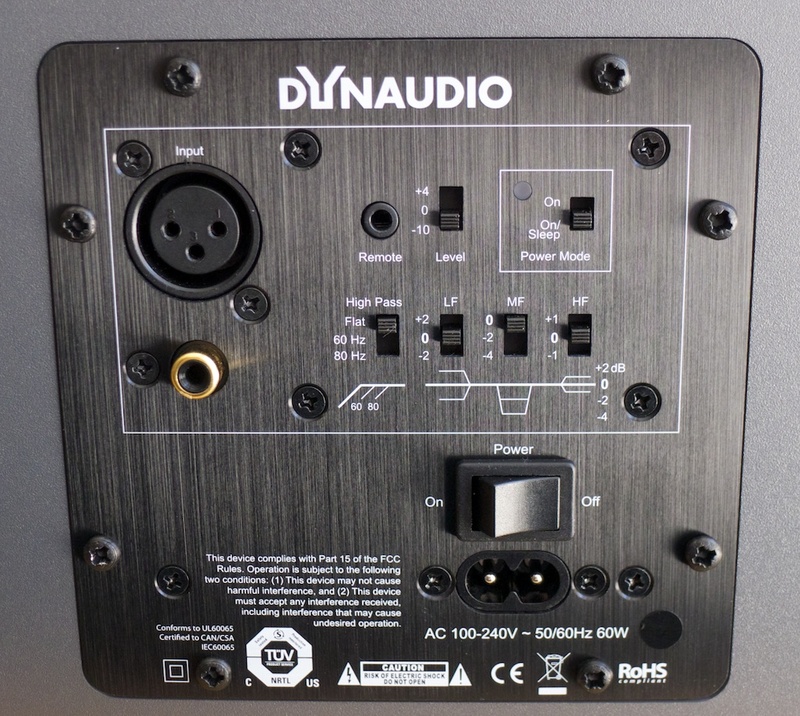 And Dynaudio? I looked everywhere and couldn't find a single mention of the THD. Where both manufacturers are even is when it comes to documenting how they made these measurements: Where? With what hardware? We'll never know. Let's face it: even if the data may be interesting, they are more of a decoration than anything else to make it seem that making speakers is a serious business. This obviously doesn't say anything about the adequacy of the products of these two brands (I could've picked any brand to illustrate my point), but rather that a comparative listening will tell you much more than any excel table you can fill with numbers whose reliability and heterogeneity are far from your control. And the same could be said about the technologies used by the different manufacturers. Every manufacturer invests a lot in R&D (and marketing) to make their products original in the quest for the perfect speaker, and to try to convince you that their formula is more effective than that of the neighbor. Be it the placement of the drivers (speakers with concentric tweeters or with the woofer on the sides, for example), the bass reflex ports, the design of the tweeters (inverted or honeycomb dome, ribbon), the choice of material (Kevlar, Berylium, silk), or even the color: just think of KRK's yellow woofer copied by Berhinger and Hercules… because it sounds more yellow! While some of these aspects are fascinating for people interested in the conception of speakers, they are only of limited use when it comes to choosing a pair of speakers because no single technology or material has proved indisputably superior over the others... although all manufacturers state the opposite! So it's useless to pick a speaker solely based on the technologies it features. Only the result of using such technologies counts! If you can't discriminate based on the tech specs and the different technologies are not that important, what should you look for when buying a set of speakers then? Two things, which will be determined by the room where you will use the speakers: their power and their reach into the low frequencies. As I said previously: a pair of speakers with a high output power in a small room is a complete waste. Be it because you use them at very low levels, which isn't the best for speakers, or because you blow up you eardrums disturbing your neighbors. And the same applies to low frequencies, as you will see. In a home studio, it's usually low frequencies which are the hardest to manage. So, unless you can actually treat your room acoustically to flatten the response, which usually implies the use of Bass Traps and other absorbent and reflective panels, you need to face the truth: regardless of the speakers you buy, and even if it's a subwoofer, you'll never get optimal lows to mix because your room will always make some frequencies resonate and boost some others; much more than mid and high frequencies. You might want to start grieving, but it's really not that bad because in the end it's in the mids and highs where the main mixing issues arise. Don't get me wrong, I never said that the lows are not important. I'm only saying that if you are working in a non-acoustically treated home studio you'll probably have to use headphones to deal with them. "Using a subwoofer in an apartment that isn't soundproofed is just as polite as blowing a cigarette in the face of a pregnant woman." That said, and since we are talking about low-cuts, it's important to point out that most speakers feature controls and functions that can prove very interesting to simplify your life and improve your listening conditions. Most speakers have XLR connections, but some also offer other types of connections (TRS jacks, RCA), which might come in really handy. But it's in terms of features where manufacturers really differ from each other. While the most entry level models are rather rudimentary, a good deal of speakers provide controls to boost or attenuate this or that frequency range, which can be very useful to adjust a speaker to the room where it will be used or to your own personal preferences. Apart from this, you should also consider usability and design aspects: are the controls on the rear or the front panel? Does it have an auto-bypass feature when no signal is present? Does it have a volume control? On the front or rear? 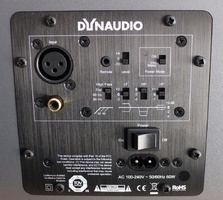 Or is it remote, like the Dynaudio Volume Box? Okay, now that we've covered that, the time has come to discuss what really matters from a set of speakers: sound. And it's not that hard to find out: you only need to listen to and compare them. At this stage of the buying guide you should start having a more clear idea of what is best or not for your needs. The problem is that there are still lots of models to choose from. You could, obviously, pick your speakers based solely on the reviews in the press, or those of other users or your friends, but considering that when it comes to listening, subjectivity is king, you'd be wise to not buy anything you haven't heard first hand. And compared. The idea is to go to a place where you can listen to different pairs of speakers with songs you know by heart, be it your own songs or someone else's. Finding a place where you can find all the speakers that interest you might be quite hard, but that's what stores are good for. And yes, it really is worth the ride and going through the exercise, but you should never lose out of sight that, due to acoustics, the speakers will hardly ever sound the same in the store and in your place. I won't detail here the methodology you should follow to compare the speakers, since it has already been the subject of an article on Audiofanzine. To complement that article, I would like to highlight two important aspects. The first is that such comparisons cannot be spread out over time and space, since the performance of the speakers changes from one room to another and hearing memory is very short (a couple of seconds). Claiming that a pair of speakers sounds better than another one you heard two months ago or even the same evening somewhere else, is utter nonsense from a psychological point of view (even if you can often hear such comments by otherwise very respectable people). If you go to a store to test the speakers and ask for advice, play fair and don't argue you have to think it over just to go to another shop to buy the speakers and save 20 bucks. That's not very respectful of the person who provided you the service and it's the best way to make sure that such listening stations disappear forever. And, as you have learned, it's very important for them to exist. You will never be able to notice all the nuances that distinguish different speakers on a youtube video or in a noisy tradeshow. And since this is a buying guide, it's time for us to take a stand and recommend some models we've tested and liked. This will never be able to replace a comparative listening, but it will hopefully help you to create you personal shortlist. 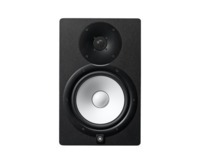 The market for monitor speakers is pretty big, to the point that you can find speakers selling under this tag for a couple hundred dollars and some others that go up to 20,000 bucks and more... per speaker. We will consider three price ranges: less $800 per pair for entry-level, less than $3,000 per pair for mid-range, and more than $3,000 for high-end speakers. I know, although well-defined mathematically speaking according to market prices, the mid-range seems too large. That's because in this range you can find both near-field and mid-field monitor speakers and you can get an excellent pair of two-way speakers for 2,000 bucks, whereas as for the same amount of money you'll only get an entry-level set of decent three-ways. And it's also important to note that even though some of the most famous speakers are in the high end, lots of professional audio engineers work with a good pair of mid-range speakers on a daily basis. As for entry-level products, they are unquestionably the ones that have seen more developments in the last 20 years. 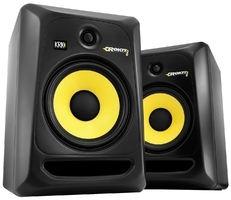 For less than 1000 dollars you can get a set of speakers that make many pros say: "if I had had a pair of those when I was starting out..." (which doesn't necessarily mean that they would trade their current speakers for them obviously! ;-)). And you are probably asking yourselves what's the difference between an entry-level, a mid-range and a high-end speaker in terms of quality. I won't be as blunt to say the sound (which you probably don't believe, anyway). It's actually the lows where you can hear more progress as the price goes up, since the highs represent much less of a issue in acoustic terms. Let's just say that with a two-way set for less 800 bucks you will have to do whatever you can with the lows, whereas as you can much more easily manage them if you spend two or three times that money. That's why I said earlier that below a given budget it's better to give up on the lows, but it's up to you to make the decision... Plus, don't forget that quality controls and manufacturing ethics also impact the price: Dynaudio manufactures its speakers in Denmark with a pretty high quality control, so it's no surprise that their speakers are significantly more expensive than other ones with similar specs from manufacturers who don't throw away anything that comes out of the factories they employ overseas. These policies have a big influence on what you later find on the shelves of your local store. More often than not, the less expensive a product is, the more heterogeneity from one model to another, not to mention more serious issues. Now you know. Please don't be surprised if you can't find in this selection this or that model by a given brand. We decided to focus on the speakers we have personally tested (and not only on word of mouth or reputation). In this regard, these recommendations will be duly updated whenever we review a model that we think deserves to be on the list. The stars indicate the rating received in the review, which takes into consideration the price at which the speakers are sold. 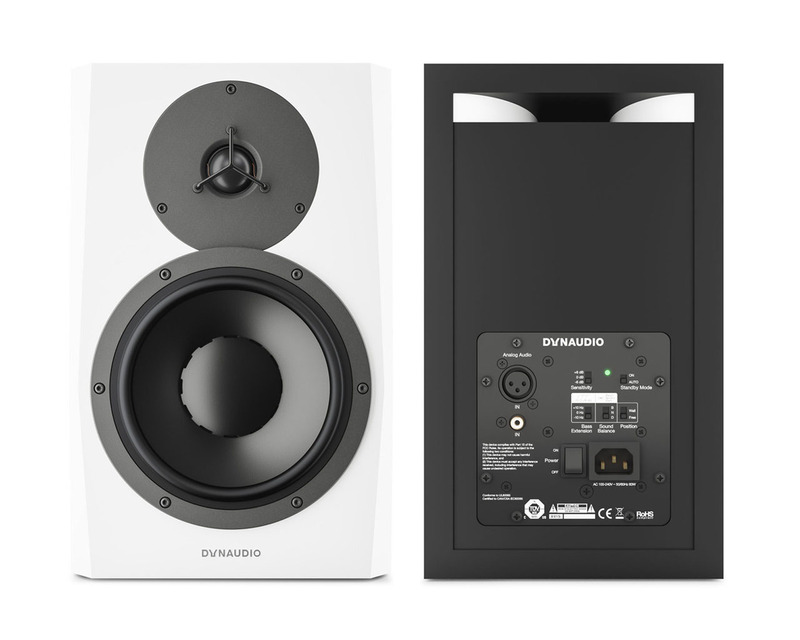 Hence, the four and a half stars of the Yamaha HS don't imply that they can stand up to the Dynaudio LYD7, for example. 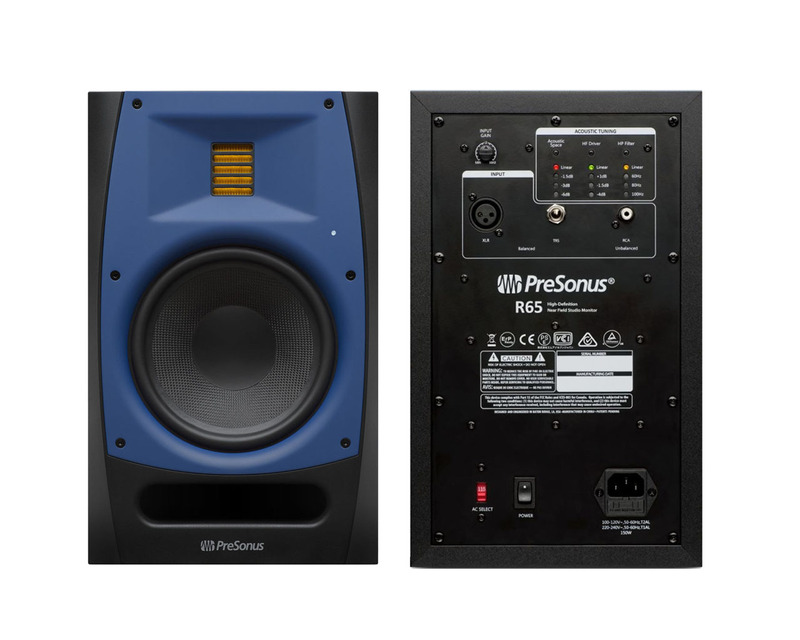 In terms of value for money, three models have really seduced us in the last couple of years: the Yamaha HS ($400 per pair for the 5" version or $700 with an 8-inch woofer), the PreSonus Eris which are even less expensive ($300 for a 5-inch pair and $500 for the 8-inch) and, significantly more expensive, the amazing Focal Alpha ($600 euros the 5-inch;the 8-inch version for $1000 would probably come into the next category). Go listen to them and you probably won't have any problem comparing them to many other models from other manufacturers. The quality in this price range is pretty homogeneous. 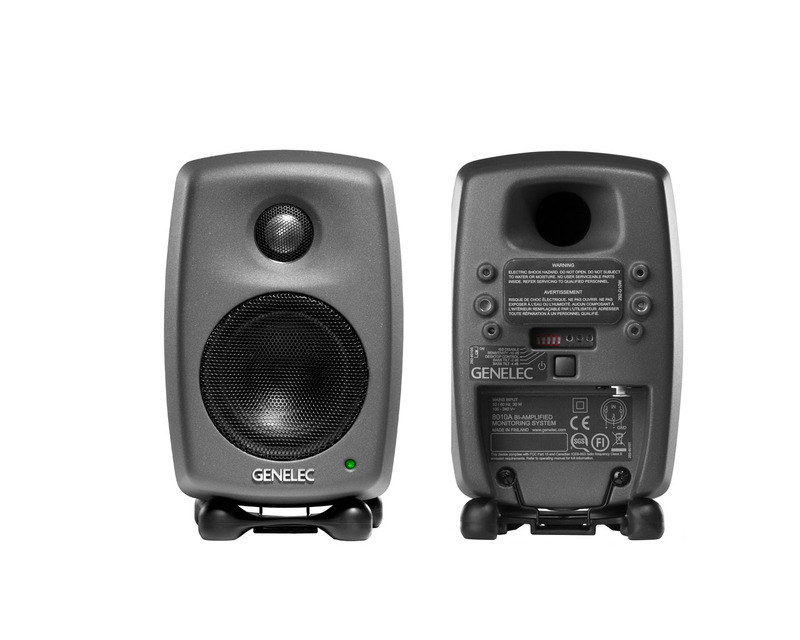 For those of you who are looking for a set of speakers that are easy to transport or don't take too much space, you can't go wrong with the Eve Audio SC204s, although slightly above the entry-level threshold ($1000 per pair), or the Genelec 8010As ($600 per pair). You have surely heard about the Yamaha NS10, true best sellers back in the '80s/'90s. They have very aggressive high-mids and almost non-existent lows, but still were used to produce many great albums. That doesn't make them a better choice nowadays, though, considering all the developments there have bee since. And yet there are still some who claim that "if it sounds good on the NS10, it sounds good everywhere." Let's make something clear: the speaker market is governed by trends linked to generations. After the NS-10 trend came the Genelecs, the Dynaudios, the Adams, the Focals, each of which has at one time or another been the talk of the town… before being replaced by another brand. Beyond $800 begins the middle class of speakers, with prices that can go up to a thousand per speaker. 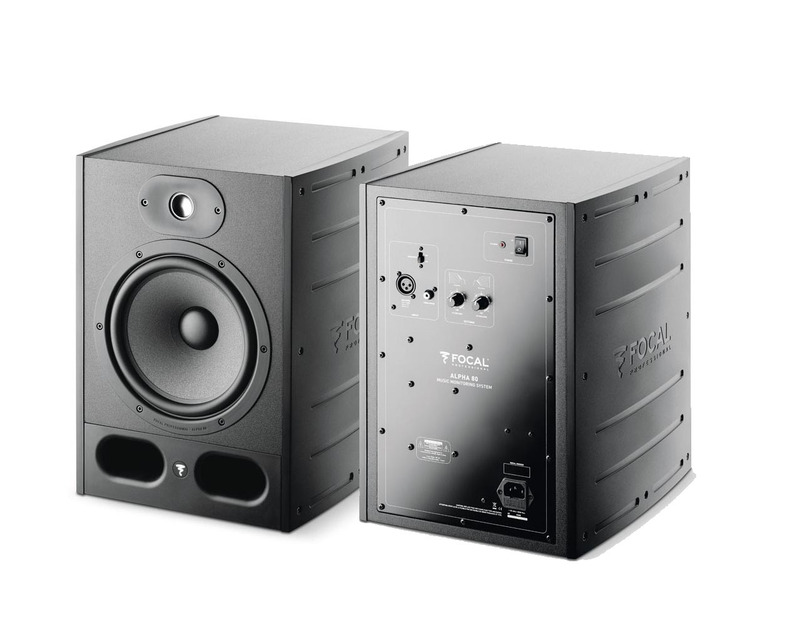 Do remember that in this price range you can find mid-field speakers already, mostly three-way. Among the models that have come through our hands, there are many ribbon speakers by the likes of Eve, Hedd and even PreSonus, although we really like the Dynaudio LYD7, and the Focal Solo6 BE, which have become a standard in the market. Let's get this out in the clear: if you are willing to spend this kind of money on a monitoring system, you don't any advice from us and can go make some manufacturer filthy rich, be it PSI, PMC, Neumann, Quested, or Barefoot. But don't forget to take a look at the high-end models by Dynaudio, Focal, JBL, Genelec, Adam, and Eve. 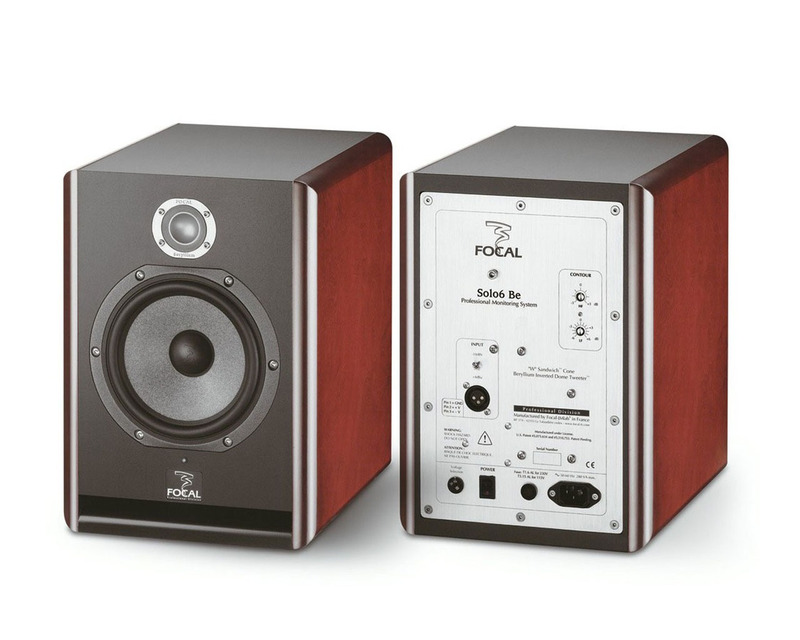 And don't miss the Focal Trio6 Be ($5600 per pair), which are really appealing due to their ability to switch from two-way to three-way and back. Buying a set of speakers is very nice and all, but don't forget to include in your budget all the accessories you need, and which most of the time are not included, starting with the audio cables: jacks or XLR, depending on your needs (although you should favor XLR whenever possible). They shouldn't be too long nor too short, not too cheap and not too expensive (more than 5 bucks but less than 30). We will come back to this in an upcoming article, but you can confidently pick up cables by Planet Waves, Cordial, Mogami. We could also discuss speaker supports, stands and foams aimed at reducing structural vibrations, while at the same time sparing your neighbors from the noises produced by your monitors and the latter from undesired vibrations of your room and furniture. Don't dismiss this as something useless because I can guarantee you that a simple stand can make a huge difference from the point of view of soundproofing and acoustic treatment. The best would be to put each speaker on a stand rather than on a table, which will work as a sound box, but not everybody has the luxury of being able to afford a dedicated place for their speakers. The average person will have to make do with supports based on shock absorbing systems like the Zaor Miza D-Stand or the Iso-Acoustics, or acoustic foam pads, like the Auralex MoPads. Make sure to choose the right size for your speakers and be wary of unknown brands that sell really cheap solutions... poor quality foams that lack the necessary density to do their job. And, finally, something we already mentioned in the articles dedicated to acoustics: remember that there are software solutions to correct the frequency response of a speaker depending on the room. It's obviously not the same as acoustic treatment, but it's a last resort trick which can result in a nice improvement of the sound quality. Featuring one single driver and a completely closed cabinet, the Auratones became a standard as a complimentary monitoring system among many audio engineers. Be it to check the mono compatibility of a mix or how it translates into the average consumer product (radio, TV, etc), in other words, to check primarily the mids. If the result holds up to what you get on your main speakers, you can probably say that you've done a good job. Don't miss the review we made of their newly revised version. The goal of a mix is to make the song sound well-balanced in terms of frequency and space regardless of the system you listen it through, be it a pair of cans, a hi-fi system, your car stereo, or a PA system. 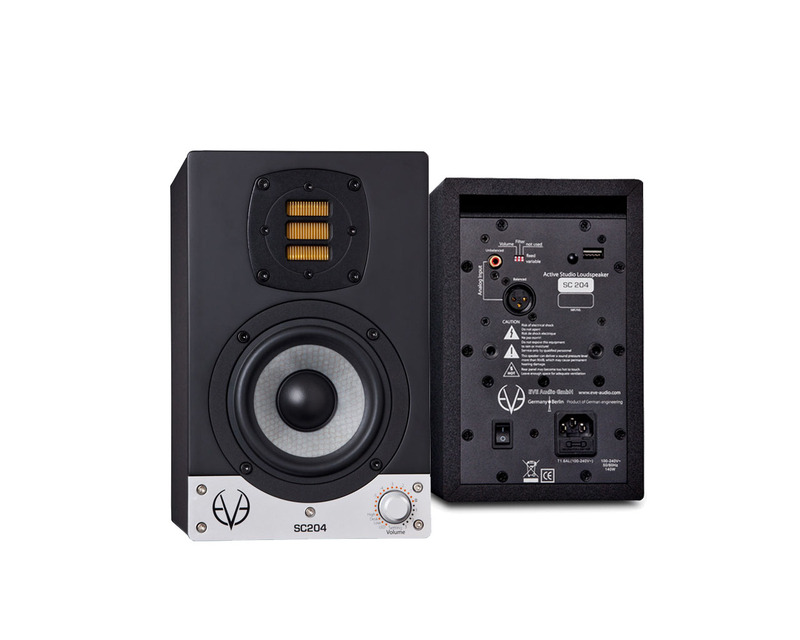 Apart from your main monitoring system, it might be wise to have an additional pair of speakers which are radically different to them to check your work. The more different both sets are, the better. Hi-fi or multimedia, it's your choice; but you shouldn't spend too much money on them. It could well be a single one-way speaker, like the Auratone commonly used in postproduction (see frame), a simple ghetto blaster like the one used by Chris Lord-Alge, or even a pair of small multimedia speakers like those made by Logitech and Hercules. A 30 bucks set is more than enough to do the trick! The only problem with having two sets of speakers is that you need to be able to toggle between them. So, unless your audio interface can handle that, you should start looking for a monitor controller: nifty little boxes that bring together in one single unit all the functions and connections you need to manage the monitors in your studio. And even if you only have a single set of speakers, they can prove pretty useful to increase or decrease the volume without the need of a software or the volume knobs placed on the rear of the speakers. Besides, depending on the model they offer a bunch of other features: Mute and DIM buttons to silence or attenuate the sound, a Mono button to toggle between stereo and mono (it is indeed important to check how your mix compares in mono and stereo), and much more sophisticated features depending on the model, like a headphones output with volume control, a Talk Back mic to communicate with a musician in another room, and, especially, the possibility to handle different sources and monitors at the press of a button. We will definitely have to come back to the layout of your home studio, but I cannot recommend you enough to read a couple of articles we've published here on how to install your speakers. The first tackles the placement of speakers and the second one their settings. But anyway, the basic advice in this regard is always: Read the f***ing manual! Even if using a speaker is usually idiot-proof, the user's manual provided by the manufacturer will inform you about the best way to place them, dial them in and any eventual running-in they might need. The latter is a practice recommended by certain manufacturers, depending on the materials of the speakers and their construction, and consists in submitting a brand-new speaker to several hours – or dozens of hours – of a particular signal (music, pink noise, etc. ), so that the different mechanical components become more flexible and couple better to each other so that you can get the best out of them. We are approaching the end of this epic article and I hope by now you have a better idea of how to choose your speakers. But I still have one last warning for you: even if you do manage to carry out a comparative listening in a store, you will only get a glimpse of the quality of the speakers. It will only be afterwards, when you have them in your home studio and have been working with them for some time, confronting your mixes with the outside world, that you will be able to get to know the speakers' attributes and defects. Consequently, beyond all the recommendations made since the beginning of this article, you will hopefully have learned that the best pair of speakers isn't the one with such and such features or technology, but rather the one you have grown used to working with. That's why Andrew Sheps explains in the interview we had with him that he has never gotten rid of his Tannoy SRM10Bs, and that he actually bought another pair just in case they break someday. Not because they are better than any other speakers made today, but because he knows them by heart. With that in mind, don't spend you life looking for the perfect speaker and giving in to the Gear Acquisition Syndrome at the first chance. While you can certainly only go so far with bad gear, a time will come when moving on to the next level in production terms doesn't have to do with having better speakers, but rather with you knowing the tools you have and the development of your main listening tools: your ears. The ear can be trained, and what distinguishes all those audio engineers you admire is not their gear, but their ability to listen to and spot details that an inexperienced ear can't. And unfortunately your ears won't develop miraculously, you really have to spend thousands of hours recording, editing and mixing. At the end of the day, it all boils down to experience... even if you can win some time. There are software tools aimed at helping you improve your listening skills in specific areas via multiple listening exercises. 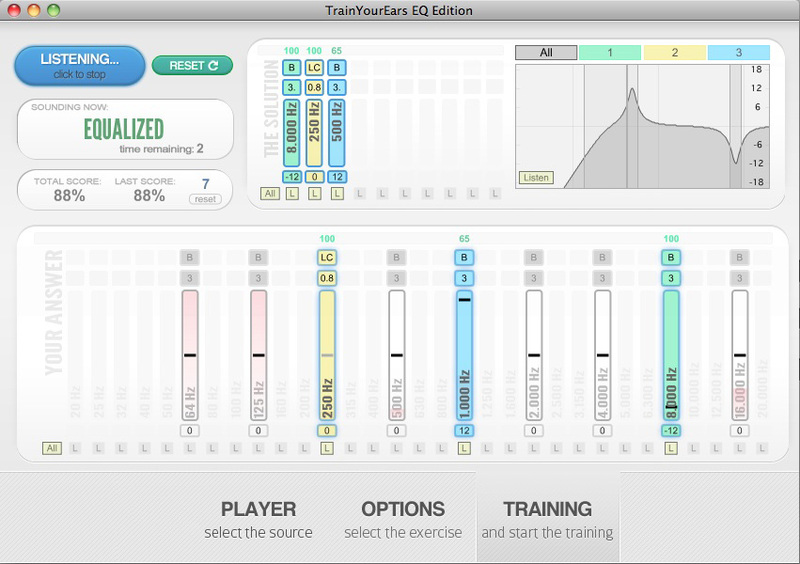 Worth the investment are TrainYourEars, for less than 90 euros, SoundGym ($15 per month subscription), the more rudimentary Quizztones, or even one of the smartphone solutions offered by Auricula or StudioEars. We hope that you will soon have THE perfect set of speakers for your needs, and that we somehow managed to bring your attention to the importance of thinking your purchase through. As I've already said before: the best pair of speakers won't be of any use in a room with poor acoustics. And it is precisely because it is not always possible to treat a room acoustically, but also because speakers don't always respond to your needs, that our next guide will be dedicated to headphones.